The Peephole, a Norman Rockwell painting , appeared on the cover of The Saturday Evening Post published August 30, 1958. This is another timeless favorite of Rockwell collectors, a classic for all the ages. This painting was Rockwell's 301st overall out of 322 total paintings that were published on the cover of the Saturday Evening Post. Rockwell's career with the Post, spanning 47 years, began with his first cover illustration, Boy With Baby Carriage in 1916 and continued through his last, Portrait of John F. Kennedy, in 1963. This was also the third cover for The Post in 1958. In 1958, there were five Norman Rockwell Saturday Evening Post covers published. on page 219 of Norman Rockwell, A Definitive Catalogue by Laurie Norton Moffatt. Norman Rockwell captures the forbidden practice of seeing a sporting event without paying admission. Knots in wood occur naturally. Eventually a knot becomes a knothole. Sometimes a boy just can't wait for the knothole to open up. That is when the boy, under cover of darkness, might spped along the hole part of the knothole. The groundskeeper for the ball park would be responsible for repairing any holes in the fence. The groundskeeper apparently has not discovered this hole yet. It is still fully operational. 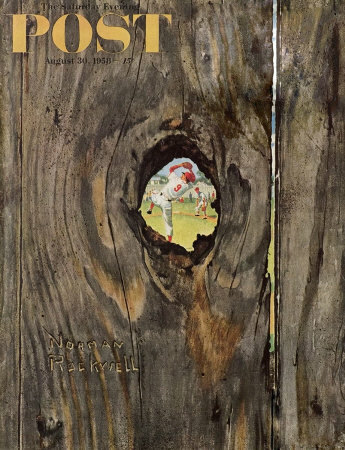 Some critics have opined that Rockwell's painting of the wood and knothole look more real than the real thing. He surely captured all the details of the wood he was painting. The Peephole was only one of 322 Norman Rockwell Saturday Evening Post covers; Here is the list of Norman Rockwell Saturday Evening Post cover illustrations. This knothole is also in perfect position to see the pitching mound. Player number 9 is just getting to his release. Maybe there is another with a view of home plate. Rockwell whimsically carved his name into the wood as a signature. That just emphasizes the feel of the painting. Do You Have A Great Story, Opinion Or Contribution About The Peephole?